We've been on a bit of an Italian bent of late so I thought it was time to try something a bit different and decided to give Bacash a go. My first lesson of the night was take a taxi - parking around here was nigh on impossible and just by chance we finally found a spot after searching for 15 minutes. After being seated and having ordered champagne to start with, I was bit put off by the rather slapdash manner of our blonde waitress, who just sloshed the champagne into our glasses, splashing it on the table. There was zero care in the way she poured, no waiting for the bubbles to subside to check the real volume in our glasses. Not a good first impression. 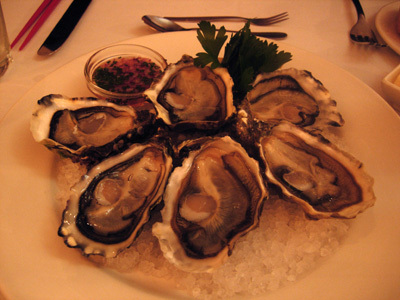 The presentation was good but the oysters hadn't been fully shucked, they were still attached to the shell. With our little spoon and fork, the job of detaching them wasn't easy. I think that our ordering of these oysters might have confused the kitchen as our next course came out within 5 minutes of finishing the oysters. Paalo has the Garfish and Prawn Nori Rolls. 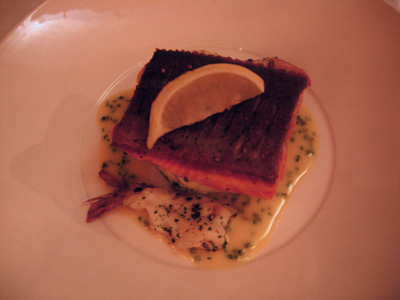 This is the type of dish we expect - fresh, excellent execution and extremely tasty. 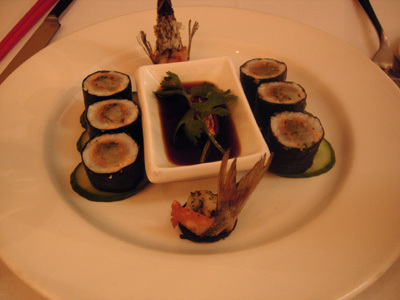 The boned garfish has been filled with salmon and prawn and then reformed into a cylinder. After cooking it is rolled in nori and sliced - served with a spicy soy based sauce. 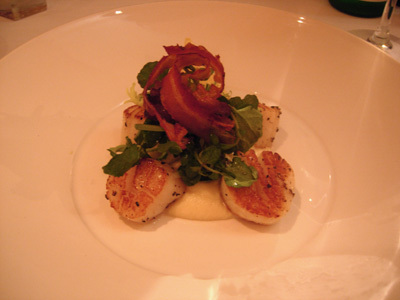 I have the Sea Scallops Seared and served on Cauliflower Cream with crisped pancetta and a fine herb salad. After those two great dishes unfortunately service let them down again with an inexplicably long wait for our mains. Once again the fish is perfectly cooked - besides the two grilled tiger prawns served on either side of the trout, large pieces of prawn studded the creamy mash. 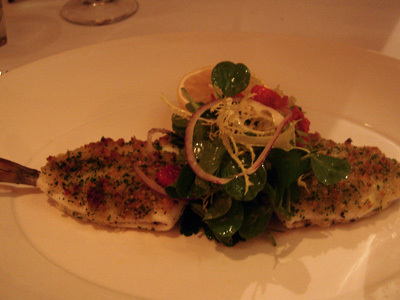 I have the Garfish served with herbed garlic crumbs and a mixed leaf salad. This dish really shows why garfish is such a fabulous fish - moist and tasty it is beautifully flavoured. One negative was the overly acidic oven-dried cherry tomatoes in the salad. 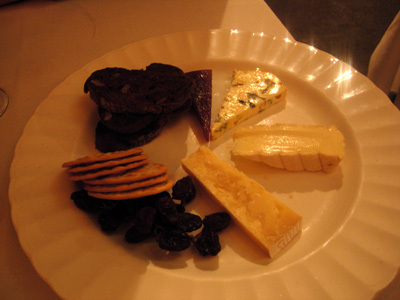 We decide to share the cheese platter - once again the service is a bit questionable, when our brunette waitress plops the plate on the table with a "here's your cheese"
After spying our various neighbours desserts we tempt fate and decide to indulge our sweet tooth. 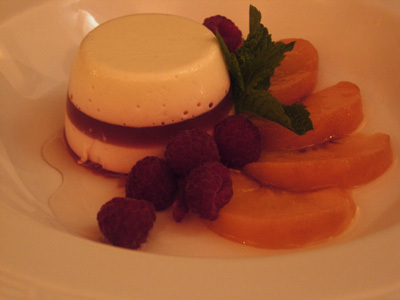 Once again we had our plate plonking waitress plonk the desserts in front of us with a "here's your desserts"
The peaches were lovely but the pannacotta was set with too much gelatine and the flavour just missed somewhat. 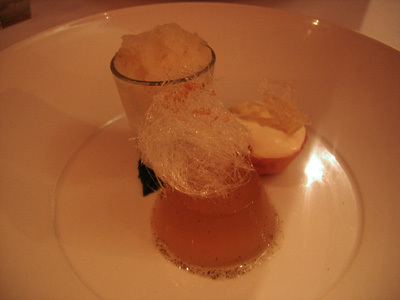 I really wanted to try this as I just love Lemon Verbena however this dish was a great disappointment. Overly sour and missing those typical refreshing characters of lemon verbena. Generally, you can't complain about the fish, it's perfectly cooked and of excellent quality, however there are aspects of the service that is questionable.